This is a story about team work and unconditional love, in every way. A walk in the park was anything but for a Melvindale man and his best friend. It was love at first sight between Lobo and his best friend John. The two are inseparable. It was a fabulous Sunday funday in Trenton. So John decided to take Lobo and bestie Murphy to Elizabeth Park in Trenton. Murphy’s mom Cindy, came too! 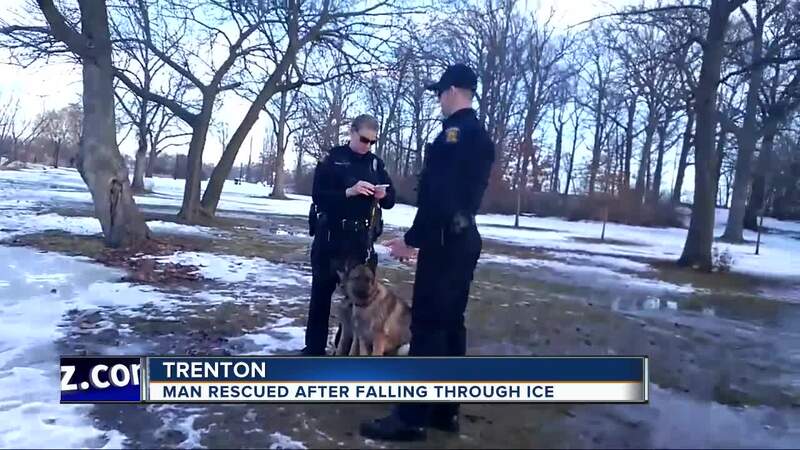 TRENTON, Mich. (WXYZ) — This is a story about team work and unconditional love, in every way. A walk in the park was anything but for a Melvindale man and his best friend. It was love at first sight between Lobo and his best friend John. The two are inseparable. It was a fabulous Sunday funday in Trenton. So John decided to take Lobo and bestie Murphy to Elizabeth Park in Trenton. Murphy’s mom Cindy, came too! When his pup got distracted, the next moments for John were pretty unpredictable, taking dog and owner on a wet and wild adventure. The group, decided it would be great, to get a little bit closer to the water, to get a glimpse of the action! There were geese down there, Lobo saw them and took off! Lobo, the two-year old German-Shepard was on the loose! He was leashed, but the buckle broke. But let’s be real, Lobo the rescue dog, was on a major mission. What happened was captured on several police body cams. Where did man and his best friend end up? And had to come to their rescue? Watch the video in the video player above.